The image-based social network Instagram still won’t commit to a specific date for moving from its iOS-only presence to Android. But the company is not in official tease mode, at least. Instagram launched a sign-up for the “beta” rollout of an Android version at its site this weekend. 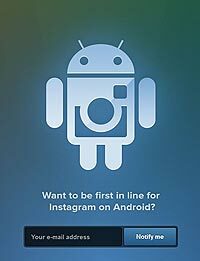 “Want to be first in line for Instagram on Android?” the site asks before prompting for an email address. No -- we have no idea what being first on line for an Android app means, unless the company plans a limited or public beta. At any rate, this tease follows up on appearances recently by CEO Kevin Systrom in which he offered a demo look at the Android version and hinted it might be better than the iOS app that has garnered over 27 million users in little more than a year. Instagram allows users to apply visual effects to their snapshots and share the result on Instagram’s own and other social networks. Apple iTunes has named the social media app its App of the Year. While Instagram does integrate with other networks, it has grown to be a substantial social net in its own right, as users often prefer to peruse one another’s images on their phones. Image editing program Hipstamatic announced recently that it was now using the Instagram API to feed photos into the network. It is the first third party to push images into Instagram, and officials claim their users are now shifting their sharing habits to the iOS photo network. Marketers are starting to leverage Instagram in creative ways. In recent talks, Systrom outlined how brands have already used the network. TechCrunch reports from the Federated Media conference that Systrom cited Burberry and its use of the network to share images from fashion shows and Tiffany’s, which solicited users to share love-themed images that it posted to its own site. Instagram has not announced specific plans for monetizing its social network, but Systrom used these examples to demonstrate his claim that Instagram could be “the next big opportunity for display advertising,” because advertisers work and speak in images.